Proto Labs’ free Material Selector is a quick reference guide to help you identify the right thermoplastic-like and metal materials for your next 3D printing project. It lists specific measurements like resolution, tensile strength and hardness to ensure you have the most suitable material and additive manufacturing process for your part’s application. Get a free Material Selector today. Switzerland-based ESCATEC, one of Europe's top providers of contract design and manufacturing services, has designed a novel motor control for a surgical drill for one of its customers. The challenge was to create a controller that was very precise, because it involved medical procedures. The precision motor control was achieved by applying a specially written, speed-dependent, rotor-position detection algorithm. Cost-effective customizable precision motion now available in ultra-compact stages. 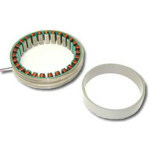 Advantages: Piezo inertia motors are self-locking at rest with no heat generation, 12mm to 32mm travel, 10mm/sec velocity. Vacuum and nonmagnetic versions available. The world’s first fully mobile aeroacoustic wind tunnel is an innovative, patent-pending test system that allows for sources of unwanted wind noise in early production vehicles to be identified faster and solutions developed sooner. Who knew shipping containers could come in so handy? NASA has tested a 3D-printed rocket engine turbopump with liquid methane -- an ideal propellant for engines needed to power many types of spacecraft to Mars. The fuel pump has hundreds of parts, including a turbine that can spin at 36,000 rpm, and is one of the most complex rocket parts NASA has ever tested with liquid methane. 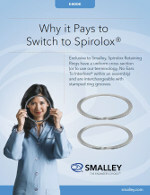 At Smalley, we design our products with your bottom line in mind. Superior performance is just one aspect we focus on; practical application and financial considerations are also important. The Why it Pays to Switch to Spirolox eBook will discuss the Spirolox Retaining Ring Series at length from a performance, financial, and practical point of view. EXAIR's new aluminum 3/8 NPT and 1/2 NPT Threaded Line Vac Air Operated Conveyors convert ordinary pipe into a powerful compressed-air conveying system for parts, scrap, trim, and other bulk materials. Their small size makes them perfect for fitting in the cramped spaces and tight confines of many production lines. The Threaded Line Vac is designed to attach to plumbing pipe couplers, making it easy to build a complete system using ordinary pipe and fittings. 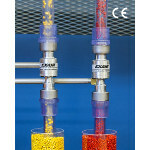 Regulating the compressed air pressure provides infinite control of the conveying rate. 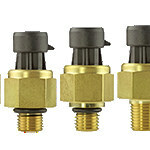 The new PX3 Series transducers from Honeywell enable industrial HVAC and refrigeration equipment manufacturers to better monitor system pressure and performance, which can potentially help to reduce energy costs associated with these systems. With an external freeze/thaw resistance from -30 C to 50 C (-22 F to 122 F), the PX3 Series transducers provide rugged environmental specs. 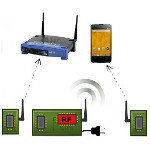 The sensors perform reliably in the presence of electromagnetic fields such as near wireless signals, radio frequency (RF) communication, and electrical devices. 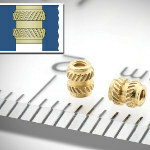 Type MSIB microPEM brass inserts from PennEngineering provide reusable metal threads to attach plastics securely in compact electronic assemblies. Their unique symmetrical shape accommodates either straight or tapered holes and eliminates any need for orientation of the inserts during installation. With threads as small as M1, the inserts install permanently into ABS, polycarbonate, and other plastic substrates by pressing them into the host material using ultrasonic equipment or thermal press. Applimotion's UTS Series Slotless Direct Drive Frameless Motors are permanent-magnet 3-phase ring-type, low-profile, direct-drive motors with a large through hole available in 29-mm to 240-mm diameters. For the ultimate in smooth operation when scanning or positioning, motors offer zero cogging and sinusoidal torque angle curves. Features include: medium motor constant and optional windings, back iron rings, and hall device feedback. Confederate Motors relies on Quickparts services from 3D Systems, including 3D printing prototypes and machining final parts, to redefine what's possible in bike design. Scientists at the University of Southampton in England have made a major step forward in the development of digital data storage that is capable of surviving for billions of years. Made of nanostructured glass, the five-dimensional (5D) digital data technology provides 360-TB/disc data capacity, thermal stability up to 1,000 C, and a virtually unlimited lifetime. It’s official. NIST’s 4.45-million-newton (equivalent to 1 million lbf) deadweight machine -- the largest in the world -- is back in one piece after a colossal 16-month effort to overhaul the 50-year-old system. Force metrology customers who rely on this unique device include U.S. aerospace manufacturers, U.S. military laboratories, and several top-end commercial force calibration labs.